Our new Chrysler product disc brake conversions are designed to bolt on to your stock factory Chrysler drum brake spindles with no machine work required. The steering arms, ball joints and suspension components are retained. These conversions use our aluminum hubs and dust covers, 11 inch diameter rotors and big piston GM calipers. These calipers offer 15-25% more braking then the later Chrysler factory 'B' body brake systems without changing spindles! 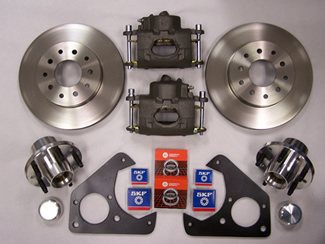 These kits are supplied complete with billet aluminum hubs and dust covers, caliper mounting brackets, new bearings and seals, new rotors, new calipers with new semi-metallic pads, caliper mounting bolts and attaching hardware. Cross drilled rotors are available as an option. Simple hand tools are all that is required for installation. 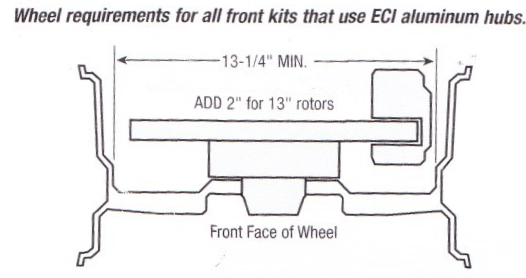 Kits for '37-54 passenger cars are available with 4-1/2 and 4-3/4 inch bolt circles, specify when ordering. 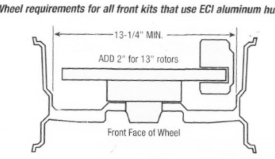 NOTE: The B, C & E body kits are available in 4-1/2 inch bolt circle only and CANNOT be used with the factory Magnum 500 wheels. Suitable 15 inch wheel diameter (or larger) disc brake compatible wheels are required (see diagram).